Touka is the class president, an outspoken and brash girl who has no patience for Kenichi's behavior and often acts violently towards him. 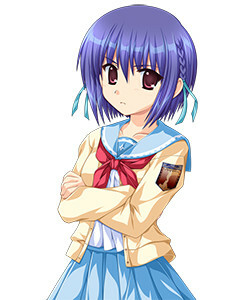 She is the worst student in the class due to being prone to careless mistakes, and this clumsiness is physical as well. Due to her obligation, she has a tenuous relationship with her mother Kyouko. She secretly wants to become a cook, but is prohibited from entering the kitchen due to an accident when she was young. Her obligation is "Prohibited from Becoming an Adult" - meaning that she must obey every order given to her by her parental figure, Kyouko. Burdened with unreasonable restrictions such as an hour-by-hour daily schedule, and a prohibition from watching TV or reading books except for studying, she often seeks small ways to rebel. "The person I love, my family and my relatives, everyone, everyone!! I'll protect them."